Nobody appreciates unwanted visitors, especially when those “visitors” are ants crawling along your counter tops while you have guests over for dinner. With the internet busting at its seams with various DIY tactics and tricks for anything and everything, what does it take to make ant DIY remedies work? Here at Cooper Pest Solutions we hear from 100’s of homeowners every year describing their ant problems to us. Some of these folks aren’t always ready to hire a professional pest control company and would rather tackle their ant problems on their own. It’s for those DIY types that we created this comprehensive article to help guide homeowners with techniques to make their DIY methods more successful. When you’re spraying repellent, location is key. Ants love man-made lines and edges, they prefer to walk along those lines in a single-file fashion. Knowing this, where should you spray your repellent? If you already know the ant trail, start there. For instance, if you know you’re seeing ants in your kitchen near your dishwasher, perhaps start by spraying along the baseboards leading to that location. If there are any cracks or crevices, be sure to include those because they might be entry points for the ants. Even though you are seeing the ants inside your home, make sure that repellent is also sprayed along the outside perimeter of the home since that’s where ants usually originate from and are more than likely returning to. While searching for the trail leading back to the colony outside, make sure all trees and bushes are trimmed enough so that they aren’t creating a bridge or road straight into your home. For instance, you have a two-story home with a kitchen located on the upstairs floor towards the back of the home. You notice ants along the counter tops in your kitchen but can’t figure out how they got in there. Then you look out your window to your deck and see that your tree branches are leaning over onto your deck railing. That perhaps may be the location that ants are coming from. Ants could be crawling up your tree, across branches, onto your deck railing then down the railing and through a small crevice near your door that leads out to the deck. By simply trimming back the branch, you may completely solve your ant problem without having to use a repellent or bait. As far as liquid repellents, you must make sure that it is consistently reapplied, otherwiseif it dries up, it will be useless and those pesky ants will be back! If you are using a dry repellent, reapplication of fresh repellent is also going to make your DIY remedy more successful. 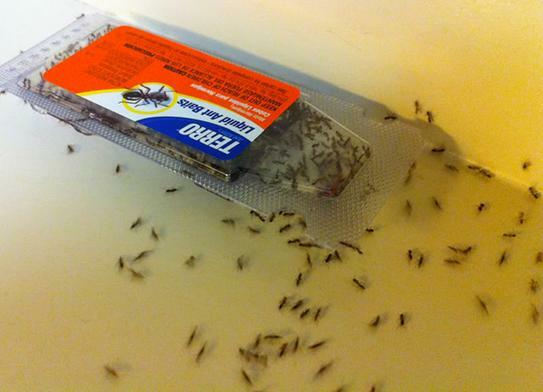 Bait placement is critical when trying to remove ants from a dwelling. Where you place the bait can determine if it will be a success or not. Just like spraying repellents, bait placement along ant trails (that include lines and edges) would be the first place to start. Follow the edges along baseboards and place your bait in a corner along that baseboard. You may also find ants crawling along the edges of your back splash, if this is the case, place bait near those edges. 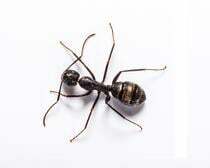 Ants are attracted to moisture, especially in kitchens or bathrooms, so if you do notice them in those rooms, place bait near the source of water. For example, if you are noticing ants in the bathroom, it’s best to place your bait at the base of the toilets, around the tub and near the sink or piping. Water sources are not limited to sinks, but can also include potted plants. You may want to consider placing a bait near a potted plant that may be in line with the ant’s trail. In addition to moisture, ants like heat sources. You may find ants near electrical boxes, hot water heaters or even switch plates. Since ants like the heat, you may want to place a few baits near those heat sources. Baits should not be in locations that could be accessible by small children or animals since they could be toxic and potentially dangerous if ingested. Does Temperature Affect the Success Rate of my Bait or Repellent? There are several factors that could determine the likelihood of your DIY ant remedies being successful, one of those being the temperature outside. Ants typically prefer warmer weather when foraging for food and water, hence why you start to notice them beginning in the spring and early summer months. 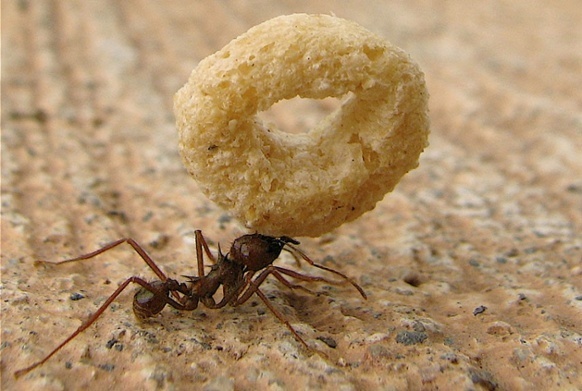 The study found that with temperatures below 50°F ants are less likely to forage. If you’re planning on putting bait out, check the temperature before you waste your time because if it’s too cold the bait won’t be consumed. According to Barbani’s study, the optimum temperature for regular foraging during day and nighttime hours, is when it is a constant temperature of 77°F. If you do not take temperature, or even weather in mind, your DIY ant remedy may fail prematurely. The ideal situation when placing ant bait is to have a dry, sunny, warm day with the temperature in the 70s throughout the nighttime hours. This will provide you with increased ant foraging activity, and by having more ants eating away at the bait, the quicker your colony will be eliminated. As with any ant removal, DIY or professional, patience is essential. If you want to eradicate the entire colony, it will take time to effectively do so. You want your bait to have a delayed response time so that it will spread throughout all stages of the ant colony, from the scouts down to the larvae. So, although you may want the ants gone yesterday, give it time, and within a few weeks the entire colony should be eliminated if all the various factors fall into place. I Tried the DIY Ant Remedies You Suggested and They Failed, Now What? There are several factors that could contribute to the failing of any DIY treatment. Was it bait aversion? Bait depletion? Does your bait or repellent have a proven effectiveness? Check out our next blog, “What Makes DIY Ant Remedies Fail?” for the answers to all your questions, opinions from our expert entomologist, and what your next steps are in eliminating your ant problem.